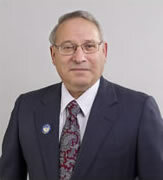 Mayor Michael Guadagno addressed attendees at Randolph’s January 1, 2012 reorganization meeting. The following is the text of his speech. I would like to thank my family, friends and residents who have come today. I would especially like to thank Mayor Trina Mitsch for showing me what a mayor needs to do. She is an excellent teacher. I’d like to thank the council members for electing me as your mayor. And thanks also go to the town employees who have taken the time to explain to me about how the town is managed. It started snowing on the first day of January 2011. It seemed that the snowplows were plowing the streets until early March. Then in the early spring, we had wind shears, which damaged several areas of Randolph. Followed by an earthquake in Virginia that some of us in Randolph felt. Followed by a hurricane named Irene, with heavy rain and tree damage and downed power lines. In October, a 12 inch snowstorm caused horrendous damage to trees and power lines, leaving a great majority of Randolph residents without power for several days and also disrupting communications with town residents. Next was the water main break on Sussex Avenue. We now have time to look back and see what we did right and what we did wrong, to further this effort. I am forming a subcommittee to look into what we can do better. Chairman for this committee will be Deputy Mayor Tom MacArthur. Tom will tell you who is on his subcommittee and what they are planning. Another problem that we had was what do we do with all of the leaves and branches? Therefore the next subcommittee that I will form will be to study the problem of storing and removing these materials. Chairman of this subcommittee will be Councilman Al Napoliello. Al will go into further details when he speaks. I feel strongly that branch collection and leaf collection should always be done by the town, with our tax dollars. We all want our town to look nice and we should all share in the cost. The massive storm cleanups would not have been possible if it was not for the foresight of the previous council members and some that are still on the council. Even in these tough financial times, they made sure that our road equipment was in great shape, ready to handle any emergency. Many years ago they had the foresight to ask state legislators to change the law that would allow us to put aside unused snow funds for future years. This year we needed those funds. Without them we would have been off to a very slow start in cleaning up our town. With all of the bad weather, Randolph was not sitting still. Renovation of our town library and community center is moving forward. A new maintenance and repair shop is being built which will service and repair both town and school equipment. Extension of a sewer line down Sussex Avenue is near completion. You might ask yourself “how can this be done with such a small portion of the town budget?” Randolph has something not too many other towns have. It has its volunteers, firefighters, rescue squad, library, animal rescue and its recreation volunteers literally numbering in the thousands. We also have our town workers dedicated to making Randolph a place where life is worth living. We are doing all of this with less employees. In 2009, we had 136 full-time employees; today we currently have 117 full-time employees. And we are using more shared services with other towns and the county. I have to give credit to our excellent town management staff, which is the best in New Jersey. There’s something else I have noticed—neighbors helping neighbors shoveling snow, moving branches and checking on senior residents. When the town asked homeowners to bag leaves, literally thousands of bags were collected. After the branch piles were removed, homeowners went out and cleaned the streets in front of their homes. This shows that Randolph residents are proud of their town. I am honored and proud that you picked me to be your mayor for 2012 and I will work hard to fulfill your trust in me. Thank you.